“I Made It Through”, faith lifting and inspiring new book by Bukky Agboola was released on Sunday September 11th, 2016 at Sword of The Spirit Ministries, Old Ife road, Ibadan, Nigeria. 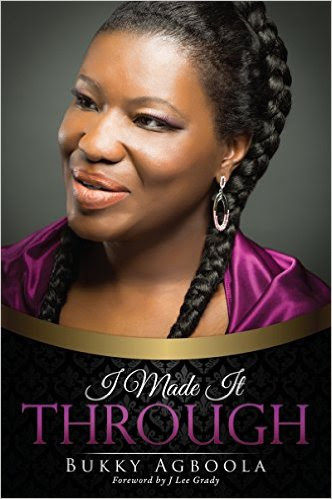 “I Made It Through” by Pastor Bukky Agboola – The Book and Song is avalable on her website bukkymusic.com . You can also check the site for for information about Bukky’s music, videos, biography, events and so on. In Nigeria Bukky has had the privilege of ministering for Bishop Francis Wale Oke, founder of the Sword of The Spirit Ministries in Ibadan, Nigeria. Pastor Tunde Bakare, founder of The Latter Rain Assembly based in Lagos, Nigeria. Pastor E. A. Adeboye, General Overseer of the Redeemed Christian Church of God, and Ebenezer Obey, one of Nigeria’s most popular recording artists. The Obey family’s encouragement and support launched her first gospel album “Devotion.” Many more friends have been a part of, prayed for, and supported her journey to date.